I was in Norway last week at the Norwegian Developers Conference, so I'm afraid the Weekly Source Code is the bi-weekly source code this month. It's amazing how international travel can really slow a body down. This trip just obliterated me. I'm slowly coming back to the world of the living, though. I've been getting more and more interested in how folks extend their applications using plugins and things. In my new ongoing quest to read source code to be a better developer, Dear Reader, I present to you twenty-ninth in a infinite number of posts of "The Weekly Source Code." This week's source is a clever "ClickOnce"-style hack for Ruby. It's cool because it brings together a number of technologies into a very clean end-user experience. The intent is to make the running of a Ruby GUI Application effortless, and it works and it's brilliant on several levels. Thanks to Sam Saffron for pointing me to it! To start out, it's a hack says the author why the lucky stiff (or "_why" for short), so it's very early and there's bugs. You can check out the code on GitHub: http://github.com/why/shoes/tree/master or clone the whole tree using git via "git clone git://github.com/why/shoes.git"
Ruby is a very aesthetically (to me) pleasing and flexible language. 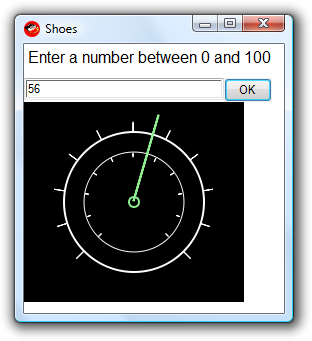 Shoes is a GUI Toolkit for making Windowing Applications using Ruby. I mentioned it back in TWSC12. Shoes is legendary for a number of reasons, but above all, it has the greatest API documentation in the history of all software documentation. The main book on Shoes Development called "nobody knows shoes" is fantastic. Even Chris Sells likes it! It feels a lot like Tcl/Tk or Rebol. It'll be interesting to see if someone writes a mainstream application that is non-trivial. Shoes works on XP, Vista, MacOSX and Linux. Do note that you'll need to right click and run it as Administrator on Vista as _why hasn't put in an elevation prompt yet. You'll need Admin to do the initial bootstrap install. "Wow, this is super. We can actually give our apps to other people now :)"
If you poke around with a hex editor inside Windows’ PE binary format, you’ll find an .rsrc section at the end of the file which contains the icons and dialog boxes. I insert the Ruby script into this mess. Fantastic hack. He shoves the Ruby script into a Windows Resource! He does the same thing for DMG (Disk Images) on Mac OSX, so you can create Ruby scripts that are portable to these two platforms. When it runs, it checks for the existence of Shoes on your system. It's in C:\Program Files (x86)\Common Files\Shoes\. If Shoes (which includes a private copy of Ruby) is not there, it's downloaded and installed, and then your app runs. Bam, one-click cross-platform GUIs. I'm not clear what the security ramifications are. Well, I am. I suspect there is no security that isn't already provided by the host operating system. Once you're running, the Ruby script has full control to do whatever it likes, so I suppose someone could write a malicious program just as they could write a malicious .NET app if they liked. 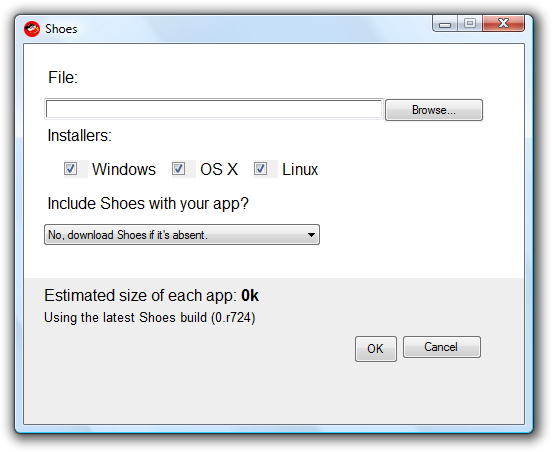 You can package your apps just by running shoes --package and you'll get this dialog. You can chose to include Shoes and Ruby inside the resulting EXE if you like. Shoes also supports custom "Widgets." For example, here's a custom Speedometer control. para "Enter a number between 0 and 100"
It's about 24 megs of libraries on disk when you're done, but you've got multimedia support and a lot of great library support in that space, not to mention a copy of Ruby itself. The download is only 2.5M bare or 6.8M with Video support. It'll be fun to watch how this evolves. I hope there will be a clean upgrade process. If you want to try running your first Ruby/Shoes app, then run this EXE if you've got Windows or this DMG if you're on a Mac to see a basic demo application, but more importantly, to experience in the installer/bootstrapping process. Actually, you don't need a seperate ruby installed in order to run Shoes. Shoes comes with Ruby built in. Just install Shoes and you're set. About that twitter client: I developed one with a friend of mine. It's on hold for the moment, as it did the bulk of it's updates through IM and not through the API. It's remarkable how quick you get addicted to continuous updates instead of every 6 seconds or so. But since twitter IM is down, we're not using (and developing) it for the moment. The source lives in github, I'll check with my friend if it's okay to open it up. I was one of the (un)lucky ones that attended NDC2008 and saw you keynote. Lucky in the sense that it was a great conference and your keynote rocked. Unlucky since we all nearly died from the stuffed and hot air! Did you enjoy the conference Scott? I've been loosely following Rebol for years and you are the first person I've seen mention it in the .NET world. I'd be curious to hear your thoughts on it and why it hasn't taken off as a language like Ruby. I know it's a young language, but . . .
Chris Cyvas - I think it hasn't succeeded for the same reason that Java on the desktop didn't succeed. It looks weird. I know it's an odd thing to say, but seriously, it's a weird looking UI. It doesn't look native, not even close. Java had the same problem for years and by the time they figured it out, it was too late. The brilliance of the language can't be seen behind the "meh" of the UI toolkit. A great post about Shoes. Thanks for the link; that particular project has languished (so far) ever since I started it. It would now need yet another fresh start, but maybe that's not a bad idea, with all the new features constantly being added to Shoes. Ruby is the bomb ! I just got started on this. InstantRails reduces to TFA (time to first app) to almost nothing. I don't know if Shoes are in there. Good to see a post about Shoes. I've been blogging about learning Ruby and I just blogged the beginnings of a Twitter client using Shoes here. _why is one of the programmers I can reference to bring me down a peg or twenty-three any time I start thinking I'm getting good at this game.